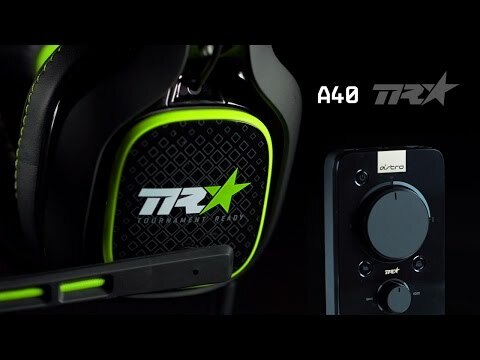 The ASTRO A40 TR Headset for Xbox One, PC, and Mac is the premier gaming audio solution for professional gamers, including esports athletes, content creators, streamers, and game developers. It was developed with esports athletes to meet their rigorous standards for audio fidelity, comfort, and durability. Able to adapt to any environment, the A40 TR arrives as an open-back headset featuring a swappable precision mic and customizable speaker tags. For loud environments such as pro tournaments, one can transform the A40 TR to a closed-back noise-isolating headset by adding a Mod Kit (sold separately) which features sealed speaker tags, synthetic leather ear cushions, and a voice-isolating microphone. For VR gamers, the A40 TR will fit perfectly over the HTC Vive, Oculus, or PS VR and deliver an immersive audio experience. The MixAmp Pro TR features Dolby Digital Surround Sound processing and enables lag and interference free delivery of game sound and voice communication to the A40 TR Headset. Its simple controls allow for quick adjustment of game-to-voice balance settings, determining how much game sound and voice chat the user hears. It also allows users to select 1 of 4 different EQ modes optimized for different game genres, as well as providing master volume control. All these features make the ASTRO A40 TR Headset and MixAmp Pro TR not only the best pro gaming headset setup, but also the ideal headset for streaming and the ultimate audio solution for all gamers and audiophiles. All TR products are the Official Equipment of Call of Duty, the leading console esports title globally. Highly recommend this headset. I was always a big supporter of Turtle Beaches ever since MW2 and WaW came out for CoD, but the new Turtle Beaches are a huge disappointment. Returned them, and decided to try out the Astro A40's which was the best decision. All-day comfort, adjustable settings including mic monitoring and mic sensitivity. If you are looking for a high quality, high performance headset, you have to buy this. Where to start! Turtle Beach fan boy here. Over the past 6 years I’ve always thought the TB headsets were the best. BOY WAS I WRONG!I purchased my headset 3 days ago (12/07/18) I plugged in and set the Mixamp and slapped my headset on. Thinking I was going to be disappointed.Right out the box the quality felt amazing. Didn’t feel cheap at all. The comfort is amazing as well. Usually after a few hours of gaming my ears would hurt from the headset cups and usually feel too small. The A40 is all around worth every penny thrown at it. I’m impressed on how loud they are and don’t rattle or cut our. Amazed by the sheer comfort given to the user. It’s very simple to hook up and understand as well. Ohhh and the mic quality is out of this world. I’m officially an Astro fan. Gave my girl my Turtle Beaches.If I could get one thing to be different, it would be to have a larger selection of mod kits or just speaker plates and maybe a few stickers in the box for the ones who want to represent. That’s it!!! Save your penny’s to buy this. Mow a lawn or shovel snow if your parents think it’s too expensive or save a few dollars extra from your work check. This is what quality is! Don’t think twice and look at the competition. So what can i say? So for the past 2 weeks i've been trying to find a headset that I can mix other audio signals into my game audio/chat audio.. (discord chat audio from mobile phone to game audio) with absolutely no luck at all. How ever i finally decided to try these Astros A40 TR +mixamp pro... was exactly what I was hoping for. I can mix in any audio signal with no buzz/hiss/crackle and STILL be able to use the headset's microphone for in game purposes. Works like a charm, check it out, you wont be disappointed.. Overall The best headset I have ever owned, The quality is great and the sound + sound customization is just amazing. The Mixamp is convenient and easy to use. I love my A40 TR+Mixamp and if you're a serious gamer then I recommend these over every other headset.